PARN » What is avian influenza (bird flu)? Influenza (or “flu”) is an infection of the respiratory tract (nose, throat, wind pipe and lungs) caused by the Influenza virus. It is important to realize that it is incorrect to call any runny nose or sore throat ‘the flu’ as these symptoms can be caused by a large number of different viruses and are usually mild. Influenza, on the other hand, is a more severe disease which kills hundreds of elderly and young children each year. Compared to the common cold, in influenza, weakness, increased tiredness, muscle aches, headaches and high fevers with sneezing, are more prominent. Just as humans have influenza, other animals also have their own version of influenza. Avian influenza (or bird flu), is therefore, influenza of birds. How is bird flu different from human influenza? Both human and bird flu are caused by the influenza virus. However, the strain (or type) of influenza virus which causes bird flu is different from the one which causes human flu. The bird strain of influenza usually does not infect humans. 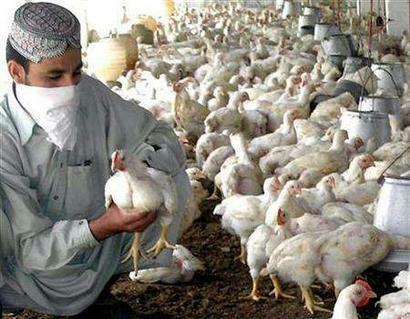 Do we have bird flu in Pakistan? Yes. Bird flu was first reported from Pakistan in 2006 and cases have been reported on and off since then. How does bird flu spread amongst birds? The virus spreads through the secretions from the nose of infected birds as well as their feathers and droppings. Surfaces like the cages of infected birds can also spread the virus. Domestic birds can also get the infection from wild birds which may not have any symptoms of the disease. How would you know a bird has bird flu? Bird flu can have two types of diseases in domestic birds (such as chickens). The first is a mild illness where the only symptoms are a decrease in egg production and ruffled (tangled) feathers. This is usually missed. The second is a more severe disease and leads to the death of 80 to 90% of chickens usually in 48 hours. It is important to note that the bird can spread the infection even before any symptoms of the disease occur. How can humans get bird flu? Can eating chicken meat give you bird flu? 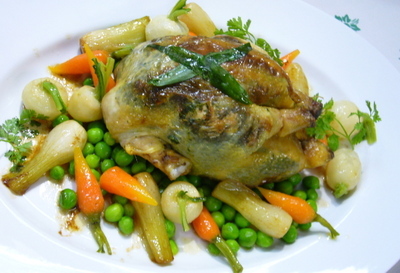 If the meat is well cooked then there is no risk of getting bird flu from eating chicken. There is a slight risk if the meat is raw or incompletely cooked (for example is there is still blood in the meat or if it is visibly raw). Can eating eggs give you bird flu? The virus is present both inside and in the shell of eggs. However, if the egg is well cooked, there is no risk of getting bird flu from an infected egg. A well cooked egg is one which is not runny (liquid). In other words, full boiled eggs and omelets are absolutely safe while half boiled eggs or half-fried eggs are not. Similarly, food with raw or partially cooked eggs (egg pudding or fresh mayonnaise) is not safe. Can one person give bird flu to another person? As the strain of influenza virus causing bird flu is specific to birds, it is not able to spread from one person to another. There have been occasions when person to person spread of bird flu has occurred, but this is extremely rare. Bird flu in humans causes a severe illness. Patients have high fevers, difficulty breathing and a cough. Some will also complain of a sore throat, headaches and diarrhea. It is important to remember, that compared to the common cold, the symptoms are much more severe. How is bird flu detected in humans? A laboratory test is needed to confirm avian influenza in humans. This test is currently only available at a few hospitals in the country. Why do we worry about bird flu in humans? When the bird strain of influenza infects people, it causes a very severe illness in which less than a third of those infected will live. If treated early more people survive, however, half of the patient still die. An additional fear is that the strain of bird flu will ‘combine’ with the strain of human influenza allowing human to human spread to occur more easily. If this occurs then a world-wide epidemic (pandemic) of influenza is predicted. Similar pandemics of flu in the past have led to millions of deaths worldwide. Drugs are available to kill the virus (antivirals). However, not all of these are effective and treatment must be started early in the course of the disease. How can you protect yourself from bird flu? Avoid all activities which will expose you to the virus. This would include direct contact with infected poultry or with surfaces and objects contaminated by their droppings. Remember the exposure risk is highest during slaughter, defeathering, butchering. Also chicken shops often have feathers and dust from chicken droppings floating in the air which can spread the infection. Similarly, avoid keeping chickens or ducks at home. If you have chickens or ducks at home, keep them cornered and do not allow them to roam freely. Do not let children play with the birds. Keep away from any dead or ill appearing birds. What can you do at home while handling chicken meat? Keeping the cutting board of raw meat separate from other cutting boards. DO NOT cut vegetables or cooked meat on the same surface as raw meat and NEVER at the same time as raw chicken. Wash your hands with warm water and soap as soon as you have handled chicken. DO NOT touch anything else until you have washed your hands. There is no need to wear gloves while handling chicken meat. DO NOT use the same knife to cut anything else until you have washed the dirty knife. Cook the chicken thoroughly. Most cooking done at home, including those for salan (curry) is hot enough to kill any viruses or bacteria. Beware of chicken which may not be cooked thoroughly such as if care has not been done while barbequing or while deep frying a large piece of chicken. Make sure there is no blood or pink parts while eating. Juices from raw poultry or poultry products should never be allowed during food preparation to touch or mix with items eaten raw. Does freezing chicken meat also make it safe? No. Freezing does not kill the bird flu virus. Therefore the same precautions must be taken when handling frozen and fresh chicken meat. Processed chicken products such as “chicken cubes” and various chicken flavorings are safe. The manufacturing process will inactivate any virus in the meat. What precautions can be taken to reduce the risk for infection from wild birds? As a general rule, you should always observe wildlife, including wild birds, from a distance. Avoid touching any wildlife. If there is contact with wildlife do not rub eyes, eat, drink, or smoke before washing hands with soap and water. Do not pick up diseased or dead wildlife. What precautions can people working with poultry take to reduce the risk for infection? Poultry farmers and those who butcher poultry should take protective measure like wearing masks, gloves, gowns, and boots. It is very important to wash the body and clothing after contact with poultry. Will the flu vaccine protect you against bird flu? The yearly influenza vaccine is designed against the human flu and not bird flu. It will therefore protect you against human influenza during the flu season but not against bird flu. Similarly, the yearly flu shot will not protect you against the common cold. 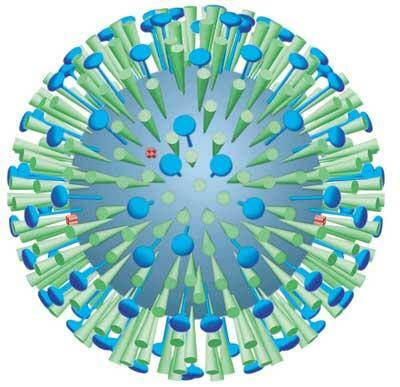 A vaccine has been developed for bird flu, though, this is currently not marketed in Pakistan. However, as most people are low risk for acquiring bird flu, getting the vaccine is not recommended at this time. Are keeping pet birds at home safe? As long as the birds are kept away from wild bird they should be safe. If you have caged birds, keep the top of the cage covered to prevent any contact with wild birds.